Silly Christmas Elf Jokes from Santa's silly reindeer! Reindeer love silly Christmas elf jokes! Everyone knows my Christmas Elves like silly jokes. But did you know my reindeer like funny jokes too? They do! But they really love silly Christmas elf jokes the best. You can find lots of silly Christmas jokes for kids on my website. But if you want to see some of the funny jokes the reindeer like, keep reading! What do elves like to eat? How do elves get to the top of Santa’s Castle? If there were 11 elves in the Workshop and another came to help, what would you call her? What do you call an elf that tells silly jokes? What do you call an elf that just won the lottery? So what do you think of the reindeer’s silly Christmas elf jokes? Rudolph’s nose always glows whenever he reads these. And it takes quite a while before the elves stop laughing long enough to start making presents again or eat their “Elf”-aghetti! Did you hear the joke about the home run? Never mind, it’s foul! Hello Santa. Do you remember me? I live in Kutztown, Pennsylvania in the United States. I hope you are well. If you really know me, who is the other drummer in the Kutztown Area Middle School Jazz Band? I think your silly reindeer is the silliest in North Pole! Ho Ho Ho! elf ones are so funny!!!!!!!!!!!!!!!! elf ones mean by jokes. what do santa clause’s puppies say? I think the elves are siller because they are elves. Reindeer are cool! I would like to have one. He could sleep in my room. i think the reindeers are hillarious , i told my mum the joke about the elf-aggheti and she lauged so hard she made me laugh. not like i wasnt already laughing the same amount as her. Well this is a tuffy urm…a… both I think yes you both are as funny as each other and I love this blog!!!! what do you do all year while the elfs make the toys?? thank you for my gifts santa claus!! Hey Santa I read all of your articals and they are very cool and the fire truck and fire rescue just went past my house. What does a dumb elf not know? I have something to say about the reindeer’s jokes, BOO! (Kidding). How come the Christmas colours are red, green and white? And how long have you lived at the north pole? I have a joke about reindeer. (They can’t take credit if they use it.) What do you call reindeer that fall from clouds? A REIN-SHOWER! i have a elf on the shelf at home and they our not silly their nice and fun. reindeer our not silly too.their all sweet. When you laugh you giggle like a bowl full of jelly. hello Santa how are you and M.rs Claus.maybe I will bake cookies. Ithink Rudolph is the funniest. HI I THINK EVERYBODY IS FUNNY.ALSO WHEN YOU COME TO MY HOUSE I WILL GIVE YOU EGGNOGE. I think the elves are the silliest!! The Elves ARE MUCH FUNNIER. BUT ITS THE SAME JOKES OVER AND OVER. We are PMSLing WE LOVE THE REINDEERS,, AND SANTA BECAUSE HE BOUGHT US A PONY!!! WE LIKE EXCLIMATION MARKS TOO!! I think the reindeer are funnier!!! the jokes about the elf’s are funny too! !BYE SANTA!!!! what do call a elf and a monkey together? a elf-monk! Reindeer is funniest DEFINETLY!! By the way im still laughing!!! That was funny!! Thanks For The Jokes.Melissa.Merry Christmas!!! that was so funny the raindeer come up with some funny stuff. i cant wait to hear more. We thought the jokes by the elves were a little sillier, but enjoyed them all! these are adorable! and funny! I think that the raindeers jokes are really funny! I think that it is a tie between the two! How is rodolphs nose so bright? Do the Elfs play football? Elf’s and reindeer’s jokes are amazing! They make me laugh even if I’m sad 😉 I just can’t stop laughing after I read’em!!! i thought thouse jokes were ‘AWSOME!!!!!!!!!!! dear’ Santa i want one of your elves really really bad . i will try my best on being good. santa i could do anything just to get a elf. i will try my best in school.i will do anything my parents ask me to do.i will do anything you want me to do. i love elfs so much and i want one so bad. i love elfs.i want one so bad.i like clyde so much do you know him. the reindeer are the silly. elf because they tell one joke i like the most is “what is one thing that elf learn in school elf abcet” and i started laughing out loud in easyer way is (lol). i love those jokes there so funny i love the cinderelfa the most. reindeer totally no afense eleves but they have funnier jokes! Who is the elves favourite musician? reindeers and eleves are funny that’s why i like them! i think reideer are always craking those little silly jokes.. to the children. Santa what would you like for Christmas? personally I think the rainder are more silly but the elfs are funny too. wich reindeer do you like the best?I like all of them.Do you have 10 reindeer or 9?p.s.hope you have a wonderful christmas! i think everybody won!all the jokes were realy good! i think their both funny. elves tell jokes.reindeer fly and eat. dashing through the bush in a rusty holden ute, kicking up the dust esky in the boot, kelpie by my side singing christmas songs, its summer time and im in my singlet, shorts and thongs, oh jingle bells jingle bells jingle all the way, christmas in austrailia on a scorching summers day jingle bells jingle bells christmas time is beaut, oh what fun it is to ride in a rusty holden ute. engines getting hot, we dodge the kangaroos the swaggie climbs aboard-he is welcome to. all the familys there siting by the pool christmas day the aussie way by the barbecue. chorus, come the afternoon grampa has a doze the kids and uncle bruce are swimming in their clothes. the time comes round to go we take a family snap, pack the car and all shooy through before the washing up. I think clumsy suits his name, but………………………………..
your reindeers are cool to!!!!!!!!! What do you call an abomidible snowman mixed with a camel? I think the reindeer are the silliest, but i wouldn’t count the elves out yet. Ho! Ho! Ho! The reindeer are happy you talked about them! Ho! Ho! Ho! 20 more sleeps until Christmas! Be good! Ho! Ho! Ho! i think that clumsy is because he’s head was up a tuba . Hi Santa,I can’t wait til Christmas!I already have mylist ready 20 Days until Christmas. Many,many things to do .I hope the raindeer get lots of treats. Those jokes are so funny I love you santa! hello santa I thing the raindeer is the funniest can I tell you a joke whats white and goes up a comfused snowflake HAHA!! I think the raindeer are the funnyest. I think the reindeer are the funniest because they write all those jokes. P.S. Are they all true? Hi, I think Santa is really cool and nice! I think both are funny. ho ho ho lol merry chrismas!!! WHAT DO YOU CALL A FAIRY THATNEVER HAS A BATH. STINK A BELL. I think those joke’s are hularles they crack me up I laghed so hard I fel on the floor. ha! santa i gust wanted to aske if you love me because i love you so much. What do you get if you cross a witch’s cat with father Christmas?Santa Claws. What do you call santa’s dog.SANTA PAWS!! I have a joke but it’s not about Christmas. What kind of teeth do you get for a dollar? LOL! ROTFL! That joke cracks me up! Oh yeah Santa clause I know how to identify all the types of christmas trees thanx to the Lorne C. Henderson Conservation Area. I also like the joke Niamh made up: what do you call an elfs phone: an elfanator. i think your raindeers are funnier! no afence to the elfs but those were pretty funny! 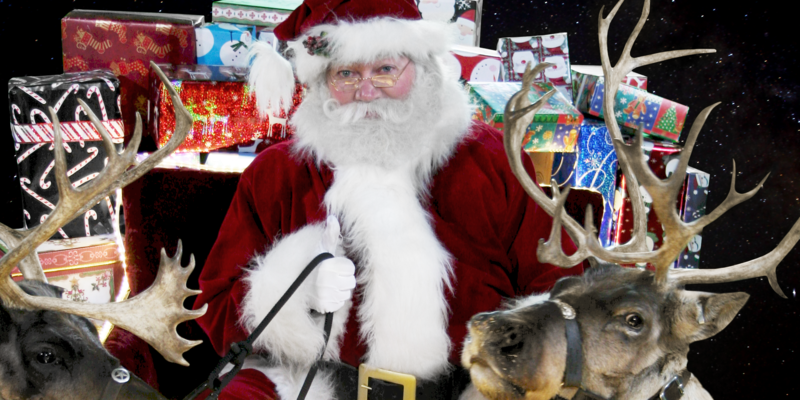 hi santa i was wondering if you cuold send me a picture of you and rudolph. what do u call an elfs phone? i think both because there both really great. I think the reindeer are funner. the funniest is clumsy my own personal elf! I think it’s the reindeer! I think the reindeer are the funniest. The reindeer are crazy. i think the elves are sillier! hi ho ho santa u rule!!!!! i love all the presents u send me thanks!!! thankyou santa merry christmas every one at the north pole!!!!!!! i think reindeer are the funniest there jokes made me LOL!!! Dear Santa.I have read you blog! I’ve heard it’s really good! i think that the elves are pretty funny but the reindeer are funny too! Yo Santa I think the Elves are Way funnier than the reindeer! [no offense Blitzen, Dancer, Prancer, Comet, Rudolph, etc]. Santa, Just wondering how many DS games do you have? what do you call a elf a nater? What do elves drink with santa before he takes off? I think both reindeer and elves are hilarious! But, if I had to chose I would pick…. hmm…. I can’t decide! They are both great! Merry Christmas! Thanks! I think the Cinder Elf-a joke was pretty funny. Hi elves and reindeer and of course santa, these jokes are hlarious. have a good christmas and a happy new year merry christmas everbody.p.s. have a happy hannukah to. I think the elves are really funny!!!!!!! Which one do you like best Santa? santa, be careful not to laugh too much, you can forget what presents the children want!!! I think comment is the silly one of all of them. I think the elfs are silly because the look really cool and they look funny! hahaha hahahahah! elves. LOVE the jokes Santa! You said you wanted me to visit the blog and I could type stuff and you could not wait till I posted something or something like that. thse were halarius! they are the best christmas jokes!my favrite was all of them. I think that you are the funniest at making jokes santa,after all you did write them right? I might have a idea… Olive them!!!! Get it!!!!! What’s you’re favorite reindeer ?????? ???????. Merry Christmas!!!! Only 25 days till Christmas!! I love Dasher, Dancer, Prancer, Vixon, Comet, Cupid, Donner, Blitzen, and Rudolph!!! I hope you have a good Christmas this year!Its snowing right now in my city!!!! To santa i hope you are looking for good kids and bad kidsand i like you to say hi to everyone please keep warm i do not want any one of you’s to get a cold. I bet all of those reindeer love to hear silly jokes! Maybe that’s what makes Rudolph’s nose glow! what do you call a reindeer with a red nose. What fish is always selfish? rudolph is the funnyis in the north pole. how does santa win the lottery? hahaha hahah LOVE IT !! funny you ride in a sleigh they ride mini van funny.